His last performance was at the Soul Train Music Cruise in February of this year. He had not been expected to sing due to his condition, but when the first bars of “Then Came You,” were sounded, Bobby (or Bobbie) Smith embarked on what became his final hurrah. When Smith returned home, recounted his son Ron Smith, a guitarist in The Spinners’ band, he caught the flu. Bobby Smith had been diagnosed with lung cancer last November, and had undergone chemotherapy. He succumbed to complications from pneumonia and flu in Orlando, FL. Funeral arrangements are incomplete, but his homegoing has been tentatively scheduled for next Monday in Detroit. Smith, born in 1936 in Georgia, moved to Michigan in 1953 with his family when he was 17. Settling in Ferndale, he spent his senior year in high school with classmates who later became the original core of The Spinners. Originally known as The Domingoes, it was Smith (who joined as lead around 1956) who suggested that the group change their name to The Detroit Spinners. The Detroit Spinners had a stint with Harvey Fuqua of The Moonglows that saw small achievements like “Sweet Thing,” and “That’s What Girls Are Made For.” These promising successes led to their being signed by Motown in 1964. Thereafter, the five-man group (consisting of Henry Fambrough, Billy Henderson, Smith, Pervis Jackson and G.C. Cameron) was a second-fiddle, sometimes hand-to-mouth Motown group that seemed to get a break with Stevie Wonder‘s “It’s A Shame,” a harbinger of what was to come. Unfortunately, like other Motown groups, they nearly fell by the wayside because Berry Gordy didn’t care to develop their talents and to promote them well. So The Spinners didn’t begin to taste stardom, however, until Aretha Franklin helped to lure them to Atlantic Records in 1971. As the Motor City began its decay and decline, Smith relocated in New Jersey in the 1980s, and then finally settled, as a senior citizen, in warm Florida. He continued active in the group until the very end. It was his life. […] Despite the fact that Smith led on many of the group’s biggest hits, many have instead unfairly credited much of the group’s success to its other lead singer, Philippé Wynne. Wynne was many times inaccurately credited for songs that Smith actually sang lead on, such as by the group’s label, Atlantic Records, on their Anthology double album collection (an error corrected in the group’s later triple CD set, The Chrome Collection). Throughout a succession of lead singers (Wynne, Jonathan Edwards, G. C. Cameron etc. ), Smith’s lead voice had always been The Spinners’ mainstay. The group continued recording into the 90s with less success, largely due to uneven material, and became fixtures on the oldies circuit. Illness and death also decimated the act, as John Edwards (Wynne’s 1977 replacement), suffered a debilitating stroke in 2002. 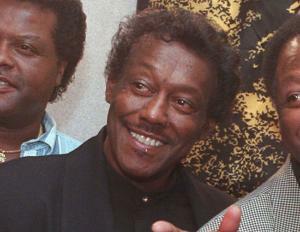 Henderson died in 2007 and Jackson in 2008, leaving Smith and Fambrough with three newer members. While the flamboyant Wynne was largely viewed as the “face” of the Spinners, Smith and Fambrough were the rocks of the group, leading the act through good times and difficult times for nearly 60 years. And Smith was an immensely underrated singer whose performances – particularly during the Spinners’ heyday – were memorable. According to an Ebony magazine article in 1976, Bobby was married to Vanessa, and had three children, Mieka, Mark and Barbara. At his death, Lorraine is presented as his widow, and his children are sons Ron Smith, Lamar White and Richie White, and daughter Vanessa Smith. No doubt, a more complete picture of his family members will emerge in the days to come. Thank you, Bobby Smith. Come back to us again. ~ by blksista on March 18, 2013.